A group of people was once traveling through a desert, when it so happened that three of them strayed away and got lost. Tired and thirsty this trio wandered around the desert in the hope of finding some respite. Finally their quest came to an end when they discovered a high well. The first man rushed to it, looked over the wall and found it full of delicious ambrosial water. He immediately exclaimed in a gesture of frenzied euphoria and jumped into it never to come back. The second too did the same. The third man finally walked over quietly over to the well, peeped over its high wall and then turned around and went back, returning to the desert to search for his other fellow travelers, to help guide them to this paradise. The life of a bodhisattva too is made of similar stuff. In strictly canonical terms a bodhisattva is defined as an individual who discovers the source of the Ultimate Truth better known as nirvana, but postpones his own enlightenment until he has guided all his fellow beings to this same source of fulfillment. A formidable task to say the least. The path of the bodhisattva is thus one of extreme self-denial and selflessness. According to the Lankavatara sutra (4th century BC): " A bodhisattva wishes to help all beings attain nirvana. He must therefore refuse to enter nirvana himself, as he cannot apparently render any services to the living beings of the worlds after his own nirvana. He thus finds himself in the rather illogical position of pointing the way to nirvana for other beings, while he himself stays in this world of suffering in order to do good to all creatures. This is his great sacrifice for others. He has taken the great Vow: "I shall not enter into final nirvana before all beings have been liberated." He does not realize the highest liberation for himself, as he cannot abandon other beings to their fate. He has said: "I must lead all beings to liberation. I will stay here till the end, even for the sake of one living soul." The word 'bodhisattva' itself is prone to a rich etymological analysis. It is composed of two words 'bodhi' and 'sattva' both of which connote deeply spiritually meanings. Bodhi means "awakening" or "enlightenment," and sattva means "sentient being". Sattva also has etymological roots that mean "intention", meaning the intention to enlighten other beings. Thus the composite word bodhisattva signifies the very essence of the divine beings it refers to. Buddhist aesthetics, very much like its literature, brings home spiritual truths in the simplest manner graspable by all. The various bodhisattvas too dominate the spectrum of Buddhist art, illustrating this abstract conceptualization in as hard hitting a manner as do the various myths surrounding them. 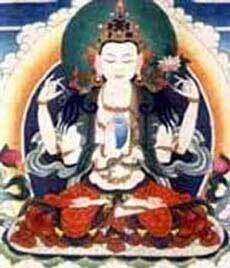 The most prominent bodhisattva in this regard is Avalokiteshvara. The word 'Avalokiteshvara' is derived from the Pali verb oloketi which means "to look at, to look down or over, to examine or inspect." The word avalokita has an active signification, and the name means, "the lord who sees (the world with pity)." The Tibetan equivalent is spyanras-gzigs (the lord, who looks with eyes). The text known as Karanda-vyuha (8th century AD) explains that he is so called because he views with compassion all beings suffering from the evils of existence. It is interesting to note here that a dominant feature in the description of Avalokiteshvara is his capacity to "see" the suffering of others. No wonder then that he is often represented with a thousand eyes symbolizing his all encompassing ability to view with compassion the suffering of others, thus sharing in their sorrows, a first step towards their ultimate alleviation. Not only that, he further has a thousand hands too which help in the mammoth task of delivering innumerable beings to their ultimate spiritual fulfillment. Once by his sustained efforts, Avalokiteshvara was eventually able to deliver all sentient beings to enlightenment, managing salvation for everyone. Enthused, he reported the success of his efforts to his spiritual father, Amitabha. Amitabha asked him to look behind himself. Turning back, Avalokiteshvara saw the world again being filled with new sufferers who awaited their escape from the constant cycle of birth and rebirth. Sinking into despair, the eyes of Avalokiteshvara shed tears of compassion. He wept so pitifully that his head burst. Amitabha attempted to assemble the pieces but did not entirely succeed. In the ensuing confusion he put together nine complete faces, each with a gentle expression. Above this he placed the demonic head of Vajrapani that functions to ward off evil, and finally at the very top he placed his own head to ensure that in the future such a happening did not recur. He thus sits on guard at the top of the rows of heads of Avalokiteshvara making definite that Avalokiteshvara in his infinite compassion doesn't get carried away, leading to his own destruction. Once at a meeting of numerous bodhisattvas at the house of Vimalakirti, the lay disciple of Buddha, a debate developed on the meaning of nonduality, an essential precept of Buddhist thought. After many bodhisattvas had finely expressed their opinions on the subject and their success at understanding its essence, it came to Manjushri's turn. He got up and announced that all the previous speeches were themselves conditioned by linguistic limitations and were subtly dualistic. When Manjushri turned to Vimalakirti and asked for his views, Vimalakirti just maintained silence, thus demonstrating the truth of Manjushri's statement. This story is a beautiful reflection on the irony of scholarship attempting to express itself through a medium (speech/language), which contains within itself a contradiction of the very fundamental ideals which it proposes to expound. In this particular case Manjushri identifies this sublime and intrinsic inconsistency. An exalted individual may wax eloquent upon the virtues of non-duality and his grasp of this abstract concept, but the very language used to expresses these views is inherently dual as it is composed of word and it's meaning, two exclusive entities. This subtle, nonetheless significant gradation brings home a profound truth taking the wind out of any sense of achievement derived out of purported scholarship. Verily thus Manjushri carries in his two hands a book and a sword. This sword is there to cut of fetters born not out of ignorance but those which arise through knowledge, signified by the book. Once the chief cook of a temple on Mount Wutai (the favorite mountain of Manjushri), was busy making lunch. Manjushri repeatedly appeared sitting above the rice pot. This chief cook, who later became a noted Zen master, finally hit Manjushri with his stirring spoon and drove him away, saying, "Even if old man Shakyamuni came, I would also hit him" In Zen temples the position of chief cook is highly esteemed. This story denotes the priority of taking care of everyday life, beyond attention to high-flowing rhetoric. Caring for the details of daily life is sometimes seen as more important than spending time in studying sutras or in concentration in the meditation halls, and indeed many monks perhaps including this chief cook, have been encouraged to abandon any preference for meditation over ordinary work. Reconciling Manjushri's actions with his status as a bodhisattva we realize that here we see a rare but distinctly significant affirmation in Buddhist thought of an existence composed of normal and 'ordinary' family life rather than that of denial. The carrying out of one's duties is as spiritually fulfilling an activity as any other 'bodhisattvic' deed. Consider for example the activity of cooking. The Bhagvad Gita says that one who cooks for others acquires the highest merit, while that who selfishly cooks food only for his own consumption commits a sin. Likewise the temple cook was engaged in an effort of the highest merit. Indeed for contemporary times this is an ultimate tribute to those women of the house who diligently provide us with sustenance which fulfills not only our physical needs, but also nourishes us spiritually. 3,000 years is the one during which no one practices the Law. After this, Buddhism having disappeared, a new Buddha will appear who will again turn the Wheel of the Law. This future Buddha known as Maitreya is beloved to be still in the Tushita heaven, in the state of a bodhisattva. It is believed that Gautama Buddha himself enthroned him as his successor. The word 'maitreya' is derived from the Sanskrit word for friendliness. Thus this bodhisattva is fundamentally said to embody the qualities of amiability and an attitude of well-meaning sympathy. According to a legend there once descended to the earth from Maitreya's Tushita heaven a Chinese layman and teacher named Mahasattva Fu, widely regarded as an incarnation of Maitreya. Fu attracted many students to his Dharma lectures. Living in a time of great hardships and famines for the peasants, he sold all of his possessions to feed the local villagers, and also fasted to give away his food to the needy. Fu once undertook a long hunger fast to protest against the king's treatment of the poor. He announced that he would finish the fast with a fiery self-immolation, as an offering to benefit all suffering beings. At the culmination of his fast, many of his followers offered to burn themselves in his place, some going to the extent of burning their fingers or cutting off their ears as offerings and engaging in other ascetic extremes. They finally convinced Fu to abandon his plan. The notion of a bodhisattva sacrificing his complete physical self or at least parts of it conforms to a similar notion expounded in ancient Buddhist texts. For example the 'Shat-sahasrika Prajna-paramita' (5th century AD) says: "Besides wealth and material objects, a bodhisattva should be ready to sacrifice his limbs for the good of others, his hand, foot, eye, flesh, blood, marrow, limbs great and small, and even his head." Indeed in the Jataka tales which are legendary stories about bodhisattvas, there abound numerous instances where they are shown sacrificing parts of their bodies or even their lives to save that of another. A persistent paradox regarding Maitreya is his visualization as an entity of the future. This presents a contrast to much of Buddhist practice and teaching which emphasizes the importance of the present, the current moment. This is sometimes referred to as the timeless eternal. According to the Buddhist viewpoint time does not exist as some external container, but is the vital expression and enactment of our own being right now. Time does not exist separate from our own presence. Once in his incarnation as a spiritual poet, Maitreya was asked by a relative to help in dealing with his son, who was becoming a delinquent. The poet (Maitreya) visited the family and stayed the night without saying anything to the son. The next morning as he prepared to depart, he asked the boy's help in tying up his sandals. As the lad looked up from doing so, he saw a tear roll down the poet's cheek. Nothing was said, but from that time the boy completely reformed. The easy camaraderie with children and attention to young people shown by Maitreyan figures amply justifies the 'friendly' origin of his name as described above. In China too, Maitreya is synonymous with his supposed incarnation as the tenth-century Chinese Zen monk Hotei, popularly known as the Laughing Buddha. Hotei is legendary as a wandering sage with supernatural powers who spent his time in village streets rather than the security of temples. His image is recognizable as the fat, jolly Buddha, whose statue can be seen in all Chinese Buddhist temples. Hotei's name means "cloth bag," and he is believed to have carried a sack full of candies and toys to give to children with whom he is often depicted in play. This scruffy, disheveled Buddha adds to our understanding of Maitreya's warmth and loving-kindness. Hotei's fat belly and affinity with children reflects yet another aspect of Maitreya in popular folk religion, that of a fertility deity. He indeed is worshipped by those wanting to have children. This ritual is especially popular in Korea. The Samadhiraja-sutra (4th century) explains why a bodhisattva does not feel any pain, even when he mutilates himself for the good of others. When Buddha was asked how a bodhisattva could cheerfully suffer the loss of his hands, feet, ears, nose, eyes and head, he explained that pity for mankind and the love of bodhi sustain and inspire a bodhisattva in his heroism, just as worldly men are ready to enjoy the five kinds of sensual pleasures, even when their bodies are burning with fever. A bodhisattva should regard every action and movement of his body as an occasion for the cultivation of friendly thoughts for the good of all creatures. When he sits down he thinks thus: "May I help all beings to sit on the throne of enlightenment." When he lies on his right side, he thinks thus: "May I lead all beings to nirvana." When he washes his hands, he thinks thus: May I remove the sinful propensities of all creatures." When he washes his feet, he thinks thus: "May I take away the dirt of sins and passion from all creatures." In this way the body can be converted into a holy vessel of benediction. Blessed indeed is he who loses his physical existence in doing good to others. A bodhisattva can never love the body for its own sake, if he cherishes it, he does so only because he will gird himself up to save someone sometime somewhere on some occasion in the moment of tribulation. By conceptualizing the lofty ideal of a bodhisattva, Buddhism sets a high standard of virtuous conduct for us ordinary mortals to emulate, thus striving for a spiritually enriched life radiant with the glow of selflessness, indeed the foundation for a meaningful and fulfilling existence, both for the individual and for the world around him, of which he is but a microcosm. Dayal, Har. The Bodhisattva Doctrine in Buddhist Sanskrit Literature: Delhi, 1999. Leighton, Taigen Daniel. Bodhisattva Archetypes: New York, 1998. We hope you have enjoyed reading the article. Any comments or feedback that you may have will be greatly appreciated. Please send your feedback to feedback@exoticindia.com Our past articles are available at http://www.exoticindia.com/newsletter.php3 Warm regards, Nitin Kumar Editor.